If you plan on doing a tasting at Kuhlman Cellars you must pre-book the tasting on their Web site at Kuhlman Cellars prior to your arrival on Saturday. You are welcome to stop in and visit or purchase wine by the glass or bottle without a reservation. No exceptions will be made. 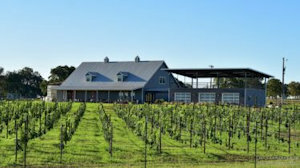 Inspired by the winding creek traversing their Texas Hill Country farm and vineyard, Kuhlman Cellars believes wine promotes an appreciation of life’s journey. Join in sharing all of life’s experiences and bounty through the unwavering quality and character of Kuhlman Cellars wines. Kuhlman Cellars crafts wine representative of Old World winemaking principles including blending high-quality fruit to accent the strongest characteristics while maintaining a subtle hand in the manipulation of the natural juice. With these principles, they strive to make wines of distinction, nuance, and great complexity. Reservation required for tastings on Saturday. Kuhlman Cellars offers their wine flights served with small bites, which change on a seasonal basis and their pairings never seem to disappoint. This tasting experience sets them apart from other wineries, and the hosts are always super friendly and extremely knowledgeable. Signature tastings are done in the barrel room and other tastings are done either in the check-in building or on the outdoor patio with a beautiful view of their vines and 290 in the distance.